I wrote an article for the October issue of Word&Way that we went ahead and posted online since it involves an event occurring soon. Hannibal-LaGrange University, a Baptist school in Hannibal, Mo., will host Missouri Attorney General and Republican Senate nominee Josh Hawley in chapel (which students are required to attend). In the article, for which I interviewed HLGU President Anthony Allen, I note a couple of ways the invite to Hawley violates the political campaign activity ban (also often called "the Johnson Amendment"). Hawley (right) opposes the political campaign activity ban and has been excited about finding a court case to challenge it. 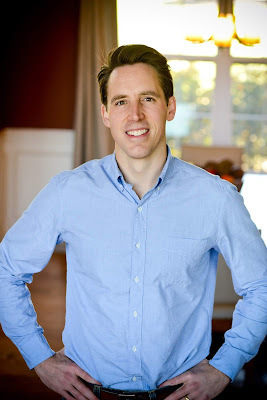 I explain more in the full article: Hawley Wants to End 'Johnson Amendment.' Now He May Help a Baptist University Break It. In the article, I quoted Amanda Tyler of the Baptist Joint Committee for Religious Liberty to explain how 501(c)(3) nonprofits should carefully navigate the idea of inviting political candidates to speak. Don Byrd mentioned the article on the BJC's blog, writing that the Hawley invite I reported on "is a good opportunity to highlight these important regulations." Byrd concludes with some good advice. "As election day gets closer, these issues become increasingly important, and the lines get more fragile," he wrote. "Religious organizations should protect not just their tax-exempt status but also their autonomy as campaign season arrives. Host all candidates, or none at all and maintain a healthy distance from the pitfalls of religious entanglement with electoral politics.